Golden Fleece - The General Screw Steam Shipping Co. Ltd.
Machinery: By Maudslay & Field. 9 knots. 300h.p. 2 engines. Length of engine room 43 5/10 feet. Registered: No.118 on 1st March 1854 in London. Owners Australasian Pacific Mail Steam Packet Co (G.S.S.S.Co mgrs). Reg. transferred to Glasgow 25th October 1855. Built for the Australian service but not so employed. Became a transport for the Government on completion. History: 25th February 1854. Due to leave the East India Docks to proceed to Greenhithe, whence, after adjusting her compasses and completing her stock of coals she will sail for Leith. Ten days ago it was thought almost impossible to prepare the unfinished work on the ship in so short a time, but, under the energetic direction of Captain Ford, the superintendent of the company, who employed nearly 500men and artisans of different classes, the task has been accomplished. She has been arranged to accommodate 37 officers, a few ladies, 917 rank and file, 54 women, 75 children, and 12 horses. After leaving Leith she will call at Plymouth to fill up with coal, water, and provisions, and to await sailing orders from the Government. 6th March 1854. Sailed from Greenhithe for Leith then to Devonport. April 1854. Due to be the first to sail to Australia under a new postal contract. 24th April 1854. Off Island of Cerigo, steering N.E. 21st May 1854, Embarked the Grenadiers at Malta. 22nd May 1854. Put to sea for Gallipoli. 26th June 1854. Sailed from Verna for Constantinople, after landing the 38th Foot from Scutari. 27th June 1854. Sailed from Constantinople. 28th June 1854. Passed through the Douro Passage. 11th July 1854. Arrived at Gibraltar, after having to stop twice on voyage to repair machinery. 12th July 1854. Sailed from Gibraltar. 19th July 1854. Arrived at Spithead from Turkey heading for Southampton. 10th August 1854. Sailed from Southampton Docks. She has on board a large quantity of artillery stores for Circassis, calling at Plymouth for the purpose of taking on board the 21st Regiment. 27th August 1854. Entered Malta harbour with troops. 14th September 1854. Landed troops at Crimea. 7th November 1854. Arrived at Malta with sick and wounded, plus 500 to 800 barrels of gunpowder on board, repeatedly applied to know what to be done with it both at Balaklava and at Constantinople. In the end it was sent back here. 9th November 1854. Sailed from Malta with fresh troops, plus the barrels of gunpowder to be returned. 10th November 1854. Major Edward Rooper, of the Rifle Brigade, died on board on his passage to Malta, of wounds received at the Battle of Inkerman. 28th November 1854. In Balaklava Harbour, unloaded new guns, large stores of ammunition lying on the beach in readiness for transport, but the huge guns press the carriage wheels of the trucks deeply into the soft earth and their horse power is inadequate to move them up the hill side. 29th November 1854. A storm of wind and rain; the camp miserable to a degree, and Balaklava intolerable. The heavy mortars with which were landed have been landed, but there is no chance of moving them, or the new guns and ammunition on the wharf. 4th December 1854. Passed Constantinople for the Crimea. 15th December 1854. Arrived at Marseilles with British troops. 1st January 1855. Arrived at Balaklava with the 39th Regiment. 4th January 1855. Sailed for Scutari. 20th January 1855. At Balaklava with the 39th Regiment which are suffering terribly from sickness, and have lost so many men that a portion of them are to be disembarked and sent ashore, so it will be more space and fit for the sick. 1st February 1855. At Constantinople. 23rd May 1855. Off Huret Castle. 24th May 1855. Arrived at Spithead from the Crimea, with 460 naval and military invalids. 24th May 1855. Went into Portsmouth Harbour to disembark. 15th June 1855. A large quantity of forage has been shipped on board and supplies of horse gear and transport bedding. 20th June 1855. Due to sail to the Crimea, via Cork. 21st June 1855. Sailed from Southampton, for Cork, Captain Scales, with 150 horses, to pick up Cavalry for the Crimea. 25th June 1855. Arrived at Southampton from Portsmouth to be surveyed for the conveyance of horses to the Crimea. It is estimated she will carry about 300 besides a proportionate number of troops. Workmen are busily engaged in removing the cabins and clearing away all impediments to the erection of the boxes. 6th July 1855. Sailed from Malta for England. 14th August 1855. Arrived at Malta from Marseilles with the ‘Witch’ in tow. 16th August 1855. Sailed from Malta with the ‘Witch’ in tow for Kamiesch. 17th December 1855. Arrived at Malta from Constantinople. 3rd January 1856. Left Gibraltar with horses for Constantinople. Passed the ‘Ripon’ off Galita. 4th January 1856. Arrived at Malta, from Gibraltar, with 260 mules, 1 farrier, 12 stokers and 65 muleteers, and left for the Dardanelles the same day. 4th February 1856. Sailed from Eupatoria with 519 horses and were disembarked at Sizepoli. 10th February 1856. Sailed from Constantinople for Malta. 15th February 1856. Arrived at Malta. 16th February 1856. Sailed from Malta for Southampton. 2nd March 1856. Transport No 75, arrived at Southampton from the Black Sea, (Constantinople) has been ordered to be again made ready for the transport service. 18th April 1856. Sailed for the Crimea. Employed in the conveyance of horses and troops from the Black Sea to England. Captain J. Seales. 28th April 1856. Arrived at Malta from Southampton and sailed the same day for Constantinople. 13th May 1856. Another day of sirocco, fiver, lassitude, and disgust. Men take sudden loathings to the Crimea on such days as these, and count the hours eagerly till the time of their departure. How glad they are to hear of every new ship and of every fresh arrival to take them from this parched, arid, and “gamey” plateau. Today they head that the ‘Golden Fleece’, ‘Jason’ and the ‘ Calcutta’ have arrived at Balaklava. 16th May 1856. Passed the ‘Bosphorus’ on passage to England with 388 men of the Royal Artillery. 21st May 1856. Arrived at Malta from Constantinople. 14th June 1856. To embark a detachment of the Royal Artillery, plus three distressed British seamen, at Balaklava towing the ‘Akbar’. 16th June 1856. Arrived at Constantinople, watered and sailed the same day. 21st June 1856. Arrived at Malta, coaled and watered and sailed the same day. 22nd June 1856. Experienced strong headwinds; anchored under the lee of Cape Bon for 16 hours. 30th June 1856. At Gibraltar. 1st July 1856. Sailed from Gibraltar, cast off the ‘Akbar’ at 10 p.m.
2nd July 1856. Cape St. Vincent S.E. 35 miles. 3rd July 1856. The ‘Golden Fleece’ and the ‘Jason’ are ordered to be discharged from the Government service as soon as their cargoes shall be landed. 7th July 1856. Arrived at Spithead. No sickness during the voyage. 9th July 1856. Arrived at Gravesend from Balaklava and her freight was landed and housed before nightfall. 16th July 1856. Sailed from Woolwich for Southampton. Having been discharged from the transport service. April 1857. Sailed from Southampton for Hamburg. 20th April 1857. Sailed from Hamburg for Southampton. 22nd April 1857. Arrived at Southampton. John Barn, purser, charged with smuggling 25 lbs of tobacco. 24th April 1857. Sailed from Southampton for Lisbon and the Brazils. She takes out a ship-letter mail, nearly 100 passengers, about £90,000 on specie, and 650 tons of cargo. John Barn appeared before the magistrates and fined £100. 4th June 1857. Sailed from Rio de Janeiro. 10th June 1857. Sailed from Bahia. 12th June 1857. Sailed from Pernambuco. 24th June 1857. Past Deal, from London, in tow. 26th June 1857. Passed Teneriffe, saw several vessels at anchor at Santa Cruz, and one steamer, apparently aground, with a strong list. 3oth June 1857. Sailed from Lisbon. Landed 70 passengers. 5th July 1857. Arrived at Southampton at 6 a.m. with 17 passenger for that port and 18 for Hamburg. Captain John Vine Hall. 22nd July 1857. Chartered to the Government for the conveyance of troops to India, in consequence of which there will be no departures of the European and American Company’s ships for the Brazils on the 4th of August and the 4th of September. 24th July 1857. Have been ordered to be ready at Portsmouth on the 29th, but that is supposed to be impossible. There is a penalty of £10 for each day’s delay. 30th July 1857. The 34th Regiment arrived at Portsmouth from Edinburgh for embarkation for India. 6th August 1857. The East India Company have succeeded in chartering this ship. 7th August 1857. Embarked the 34th Foot and dropped out to Spithead. 8th August 1857. Sailed from Spithead at 4 p.m. for Calcutta. 19th August 1857. Arrived at St. Vincent, coaled and proceed on her voyage to India. Managed by European and American Company. Owned by European and American Company. 15th October 1857. Arrived at Calcutta with a complete regiment of Her Majesty’s 34th in perfect comfort, without a sick man, in 68 days. 18th November 1857. Arrived at Calcutta. 24th December 1857. Sailed from Calcutta with passengers and cargo. 30th January 1858. Due to sail from the Cape for London. 29th February 1858. Arrived at the Cape for Calcutta. 13th March 1858. Arrived at Gravesend from Calcutta. 22nd March 1858. Been chartered for the Indian transport service. 8th April 1858. Embarking rank and file for Calcutta. 26th April 1858. Arrived at Cape of Good Hope from Calcutta for London. E & A Co.
16th May 1858. Sailed from Gravesend for Boston. 27th June 1858. Arrived at Boston. 9th September 1858. Sailed from the Cape of Good Hope. 25th October 1858. Arrived at Falmouth. 29th October 1859. Passed Deal for London. 1860. Chartered from G.S.S.S.Co by Galway Line for one voyage, Galway to Boston via Newfoundland. 2nd June 1860. Sailed from Galway for New York. 23rd June 1860. Sailed from Galway. 4th July 1860. Arrived at St. Johns at 3 o’clock p.m. and sailed in the evening (12 o’clock) for New York. 23rd July 1860. Sighted southward of St. Johns from New York. 2nd August 1860. Arrived at Galway at noon. 17th August 1860. Arrived at Liverpool from Galway. 18th December 1860. Ship taken over by the East India and London Shipping Company. 1st January 1861. Arrived at Port Elizabeth. 17th June 1861. Sailed from Kingston, Ireland with troops for Canada. 1st July 1861. Passed Father Point at 2·15 from England with troops and stores. 27th July 1861. Due to sail from Quebec but her anchor fouled with another ship, whereby she was prevented from leaving. 28th July 1861. Sailed from Quebec with a general cargo and 22 passengers. Captain George Western. 14th August 1861. Called into Plymouth to land two passengers then sailed for London. 2nd January 1862. Sailed from Gravesend for Calcutta. 25th May 1862. Sailed from Calcutta. 25th May 1862. Sailed from Calcutta with about 70 passengers. On the passage down the river she scraped the muddy bottom no less than three times. 31st May 1862. A lady died of dysentery and was buried at sea. 3rd June 1862. Arrived at Madras. 7th May 1862. Sailed from Madras with a full complement of passengers and cargo. 12th May 1862. A large American steamer bore down upon the ship, the commander immediately cleared for action, being armed with six long 24’s and lots of powder and shot; but on the nearer approach of the hostile American it was discovered to be a French transport. 10th July 1862. On route from Madras to London the screw was found out of gear. 16th July 1862. In raising the screw Captain Western was struck by a piece of chain and died that night. The chief officer, Mr. Randle, is in charge. 19th July 1862. Captain Western was committed to the deep. 30th July 1862. A heavy sea lifted the first cutter off the davits, the next roll dropped her on to the muzzle of a gun, and stove her in. 31st July 1862. The fore-top-gallant backstay carried away. 1st August 1862. Blowing a tremendous gale, the foremast being considered in imminent danger, it was deemed advisable to cut away the fore-topmast to save the lower mast; but before this could be effected, and whilst bracing up the fore-yard to allow the topmast to fall clear, the foremast went over the side, about 12 feet from the deck, carrying away with it the main and mizzen masts, the former about 4 feet, and the latter close off from the deck, with the screw out of order she was a perfect wreck, lost four boats and two guns. 3rd August 1862. The screw was again in working order. 6th August 1862. Shipped a tremendous sea on the port bow, which washed away about thirty feet of the bulwarks, stanchions and all, and split the covering board, and knocked down the shears, which in its fall smashed the ship’s galley. This tremendous rush of water carried with it sheep pens, lamps, side houses, filling the forecastle with water, and covering the decks with paint, blocks, and splinters. 12th August 1862. Put into Simon’s Bay for repairs. Met up with the ‘Calcutta’ in the Bay, her chief officer, Mr. Stewart, took the command of the ‘Golden Fleece’, he being the senior of Mr. Randle. 22nd September 1862. Sailed from Simon’s Bay after being detained by the injuries she received in the severe gales encountered on her passage from India. 21st October 1862. Arrived at St. Vincent. 26th October 1862. Sailed from St. Vincent. 31st October 1862. Requiring to shift some cargo aft to trim the ship, it was found that some of the iron girders and stanchions of the ship had been broken and displaced. The straining of the ship had started the planks of the deck so much and caused them to leak, that most of the cabins were hardly inhabitable. 19th November 1862. Sighted England. 21st November 1862. Put into Mount’s Bay, Cornwall, with boilers injured and under jurymasts. She was short of fuel. She had 60 passengers. 23rd November 1862. Sailed for Southampton after coaling. 28th November 1862. Passed Deal in tow, from Southampton for London. 29th November 1862. Arrived at Gravesend from Calcutta. 7th January 1863. East India and London Company, Captain Bird. Left the Thames and passed Beachy Head at midnight. 8th January 1863. Passed St. Catherine’s Point at 10 a.m.
9th January 1863. Off Plymouth at 3 a.m. under full steam and fore and aft canvas, for the Cape of Good Hope and India with a full cargo and 84 passengers, including several military officers. 9th August 1863. Arrived at Cape Town. 19th October 1863. Sailed from Gravesend at 2 p.m. for Calcutta. Commander Bird. 20th October 1863. Passed the Nore at 7 a.m.
21st October 1863. Passed the Isle of Wight at 6 a.m. and Plymouth at 6 p.m. under full steam bound to Madras and Calcutta with a full cargo and 118 passengers. 2nd December 1863. Arrived at Cape Town with the new Lieutenant-Governor, Sir Percy Douglas. 20th February 1864. Sailed from Calcutta. 6th March 1864. Sailed from Madras. 10th March 1864. Off Deal. 9th April 1864. Sailed from Table Bay. 20th May 1864. Landed her mails and three passengers at Plymouth by pilot boat. On board she had 90 passengers from India, and 22 from the Cape, and a cargo of rice, indigo, and cotton. Captain G. E. Bird. 22nd January 1865. At SN. 24W, outward from London. 26th May 1865. Near St. Helena. 21st June 1865. At Tilbury to embark troops for India. 27th June 1865. 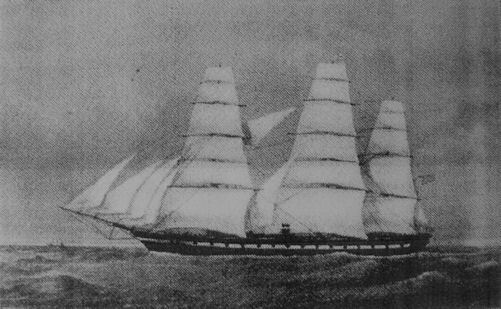 The first vessel of the Mercantile Marine which has obtained the Admiralty warrant to fly the blue ensign, commanded by Lieutenant R. W. Ker, of the Royal Naval Reserve. 30th June 1865. Sailed from Gravesend and passed Deal for Madras. 1st July 1865. Off Isle of Wight and called into Dartmouth. 7th July 1865. Private J. Reynolds dropped down dead while on his way to the Cookhouse with a rupture of a large blood vessel in his chest. 10th July 1865. Off Madeira. 26th July 1865. Mrs. Eacleston gave birth to a daughter. 2nd August 1865. Mrs. Tapper gave birth to a son. Mary Anne Daley died after a short illness of inflammation of the lungs. 5th August 1865. Troop Sergeant Major Chesters child died. 6th August 1865. Fore topmast carried away during a squall of wind. 9th September 1865. Arrived at Madras with the 16th Lancers. 15th September 1865. Sailed from Calcutta. 8th November 1865. Sailed from Calcutta, but detained in the Hooghly, Calcutta, which has been cut off, as a channel in the river at Middle Point has silted up without warning, preventing vessels from coming or going out to sea. 23rd June 1866. Captain Hardy, 91 days from Melbourne, off Penzance, and landed mails and passengers. 3rd August 1866. At lat 32•19S., long 14•58E , standing to westward. 13th September 1866. From Algoa Bay for London, spoken with. 2nd October 1866. Arrived at Gravesend from Algoa Bay. 12th October 1866. Sailed from the Victoria Docks for Gravesend. Chartered by the Transport Department of the Admiralty for the conveyance of troops. Every provision has been made for the comfort and accommodation of the officers, the men, and their families, which are to accompany them under the regulations of the Admiralty Transport Department. The system introduced by Dr. Edmonds, R.N., which has for some time been adopted by Her Majesty’s Emigration Commissioners in all ships chartered by them, is now also applied to Government troopships. Provision is made for effective ventilation whether during the calms under the line or in stormy weather, when all ports or even hatches might require to be closed. This is effected without any machinery liable to derangement, but by the economical use of steam as a rarefying agent, or, when a more powerful action is desired, by its direct propulsive action. 14th October 1866. An order was received at Chatham garrison, from the Horse Guards, directing detachments from the 1st Division of the Depot Brigade, Royal Artillery, to be held in readiness to embark for Hong Kong and Japan. 17th November 1866. Arrived at Portsmouth to embark the troops then sailed for Queenstown. 21st November 1866. Arrived at Queenstown to embark the 73rd Regiment. 24th November 1866. Sailed from Queenstown for Japan with 700 men, women, and children. 8th December 1866. Sailed from Gravesend for Hong Kong, with 728 officers, men, etc., of the 73rd Regiment. 10th December 1866. Hoax note found in a bottle saying the ‘Golden Fleece’ had sunk. 25th December 1866. Crossed the line. 3rd March 1867. Arrived at Hong Kong, five deaths unfortunately took place, but whether from accident or disease is the question; while six births increased the number of human beings on the roll at her arrival to one more than she had on board when she left England. 21st April 1867. Sailed from Hong Kong with the 20th Regiment for Natal. The departing regiment was in perfect health, and it is to be hoped that it may reach its destination in the same state; but there are painful stories going about concerning the want of proper comfort and ventilation on board from which the 73rd suffered on their passage out. 2nd May 1867. Arrived at Durban from Hong Kong with the soldiers of the 20th Regiment, from India, to relieve the 99th. 7th May 1867. Sailed for East London. 18th May 1867. Landed the headquarters of the 99th Regiment at Table Bay. 19th May 1867. Sailed for London. 30th May 1867. Arrived at St. Helena, Captain R. Nicolas, from China, 65 days and Table Bay 11 days bound for Queenstown. 30th September 1867. Anchored off Deal for London from Aden. 6th September 1867. A large number of pack saddles and harness, Maltese carts, and other stores, marked “Abyssinia,” were transported in Philips’s barges from Woolwich Arsenal to the Victoria Docks to be loaded onboard for Bombay. 1st October 1867. Sailed from London for Aden. 3rd October 1867. Sailed from Portsmouth. 13th October 1867. Spoken to in 3N. 28W from London for Algoa Bay. 7th December 1867. Arrived at Aden all safe and well. She is engaged in the Abyssinian Expedition as a hospital ship. 9th May 1868. Past Deal for Algoa Bay, and has put back to Gravesend. 11th June 1868. Sailed from Aden for England. 14th June 1868. Spoken to 4N. 14W off Jean Fernando, from London for Algoa Bay. 14th July 1868. Arrived in Simon’s Bay, Captain J. Smyth, for coal from Aden with officers and troops from the Abyssinian war. 31st July 1868. Sailed from St. Helena. 8th August 1868. Crossed the line. 2nd September 1868. Passed Plymouth on passage to Spithead from Aden with military invalids. 22nd January 1869. Passed Deal for Algoa Bay. 26th January 1869. Sailed from Liverpool for Mobile. 21st May 1869. Arrived at Liverpool from Mobile. June 1869. Sailed from Algoa for London with a cargo valued at £17,113. 10th August 1869. Reg. closed. Sold to Foreigners. 21st August 1869. Re-purchased and re-reg. in London ? 162. Owned by Merchants Trading Company Ltd., 50 Browns Building, Liverpool. Walter Fiober, Master. Tonnage 1,43911/100. Length 2926/10 feet. 3 decks. 3 masts. Barque Rigged. 4th September 1869. Sailed from Liverpool for Alexandria. 10th September 1869. Sailed from Penarth for Alexandria sank in four fathoms at low water in Penarth Roads.